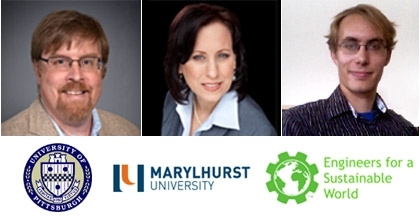 On July 9th, we held the fifth in a series of webcasts featuring educators from leading colleges and universities demonstrating how Sustainable Minds is being used in education. From traditional to new online degree programs, educators from a broad range of disciplines are using Sustainable Minds to enrich and expand these programs, teaching lifecycle thinking through hands-on experience. This webcast showcases three educators from chemistry, engineering, and marketing as they share their learnings and success stories. Their stories demonstrate using Sustainable Minds in the classroom, in online programs, and in collaborative projects for the campus by undergraduate students, graduate students and professionals. Educators have found that cloud-based LCA software enables interdisciplinary collaboration for discovery & introduction to product development as well as real-life technical challenges. Following is a summary of the presentations. Eric J. Beckman, Bevier Professor of Engineering, is a faculty member of the Chemical Engineering Department. He co-founded the Mascaro Institute for Sustainable Innovation and created a course on chemical product design in 2002, which has now become a required course. His research is focused on green chemistry and green product design. For several years he has been trying to find a good way to introduce life cycle design concepts into his product design course. Currently, in undergraduate Chemical Engineering curriculum, it is rare to find life cycle assessment being taught. Eric introduced Sustainable Minds in the course ChE 614: Product Design for Engineers. His challenge was to cover green design concepts in a two-week period and to provide something rigorous for chemical engineering seniors. The project assigned was to re-design a generic shampoo formulation. Eric provided the students with a model formulation for shampoo and challenged them to create the baseline assessment and to explore improvements that would reduce the environmental performance. Eric worked collaboratively with Sustainable Minds staff to add new data to the database. The project required students to consider not just the ingredients of the shampoo but also the packaging. In addition, it was important to include water in the assignment. A key takeaway for the students was that water is not free. Eric provided insight into the varying strategies that students explored. Students looked at simple substitutions, complex substitutions, bio substitutions, eliminations and package re-design. A key learning for Eric was that Sustainable Minds allows the introduction of life cycle aided design into a product design course in a meaningful way without requiring significant amounts of scarce class time. Eric stated that chemical companies maintain active green design programs and it is imperative that students understand the basics of life cycle analysis and how it can be applied to product design. An accelerated online program – Increasingly, colleges and universities are looking at online programs for their long-term strategy and Marylhurst is proud to be on the leading edge. Wendi shared an example of how rich this experience can be and that a downloaded discussion thread was 70 pages long. Unique student demographics – The average age of students is 38 and many are working professionals who have families. Online learning gives them the flexibility they need. Global influence – Students work individually and in teams and collaborate from all over the world. Wherever students can access the internet, they can learn. Practical application – In online learning, practical application becomes very important. Sustainable Minds integrated into the curriculum supported the goals of this program. Wendi Butler, Adjunct Professor, is an undergraduate and graduate level faculty member and Area Chair, teaching business management and marketing at several universities. Wendi has been teaching for over 13 years and has over 25 years of marketing, sales, and management experience in industry. Exploration: Students explored the software and the SM Learning Center. Wendi felt that it was excellent for students without a strong sustainability background. The ecodesign strategies in particular helped them to get started easily. Discussion: In this course, there are two discussion questions per week. This helps students to share their experiences with the tool and to share what they’ve learned. Marketing Plan Project: This taught the students the practical applications of sustainable marketing theory. Students complete 5 phases of a marketing plan over 5 weeks. Students collaborate to choose a durable consumer goods product. Using Sustainable Minds, students can justify the product design and consider the supply chain and product life cycle. LCA helps students to justify how their greener product can be differentiated and positioned in the competitive market. Ecodesign data helps students develop their product tactics for the marketing mix, build awareness of product design and distribution, and inform a cost analysis. Wendi provided some examples of the Marketing Plan team projects. One student team examined a luxury fountain pen. Students tried to justify how luxury brands retain positioning and perception if the material costs are lower or recycled. In a second project, students produced a smart power strip. They were concerned about credibility and greenwashing and wanted to use LCA for product design and the choice of materials, packaging, and transportation. In a third project, a team designed a high altitude climbers’ tent. The choice of tent stake material was greatly discussed by the class and the cost, price durability, and perception were debated. Wendi also provided some interesting quotations from students reflecting on their experiences using Sustainable Minds. ESW is a non-profit network that was established in 2002. It is an international organization with 34 chapters at different universities. The focus of these chapters is working on technical sustainability projects – on campus, with local communities, and international work. Beyond these, ESW has expanded its webinar offerings to include skills-focused webinars. Alexander Dale, Executive Director, Engineers for a Sustainable World. Alex described himself as a ‘non-traditional STEM graduate.’ He recently received a PhD in Civil & Environmental Engineering from the University of Pittsburgh. Alex has a background in energy and water policy and has used research methods that focused on LCA. As his first post-graduation position, Alex has stepped into the role of Executive Director of ESW. ESW partnered with Sustainable Minds to provide an in-depth LCA experience to its members and chapters. This led to the creation of the LCA+U Challenge. The goal of this challenge was to provide students with exposure to LCA through the use of Sustainable Minds and to have students explore implementing sustainability on their campuses. Students were provided with access to Sustainable Minds and support & mentoring from ESW and SM staff. Six projects were selected and in this webcast Alex showcased two of the projects that he felt were exemplar. The first, conducted by students at [The] Ohio State University, examined energy and water consumption of an engineering laboratory on campus. This project was an example of combining on-campus service learning and LCA. Students focused on water usage and identified rainwater catchment as one solution. They are currently working with the Facilities Department to build a pilot project and estimate that they can save about $100,000 a year in indirect energy costs. A second project by students at the Rochester Institute of Technology examined take-out containers to determine the most sustainable option. At RIT there are 17 different dining areas on campus, all with different containers. The students surveyed the existing materials and identified a re-usable container as the one with the lowest environmental impact. Dining services is currently reviewing the results and using the students’ findings to make informed decisions. One of the key learnings that Alex mentioned was that the cloud-based approach of Sustainable Minds fit well with a network of chapters. He concluded stating that ‘the future is networks,’ that is, cloud software such as Sustainable Minds can enable more people to work with LCA data. Further, programs like the LCA+U challenge provide guidance on real applications of LCA. The range of stories in this webcast demonstrate the broad applicability of Sustainable Minds and its influence in teaching life cycle thinking in a hands-on way, in the classroom, in online programs and across campuses. Watch for more webcasts in this series, where we showcase more educators learning new things, building on what they know and getting started teaching in new ways. Curriculum Library: Sustainable Minds has example courses and projects from faculty teaching with Sustainable Minds. They are available for your review and use.